Undated letter from 1916 from Private Edward Joseph Seidelman. Sent from Camp Hughes, Manitoba to Private Seidelaman's family members in Vancouver (although it seems that the letter is directed more to his mother) . 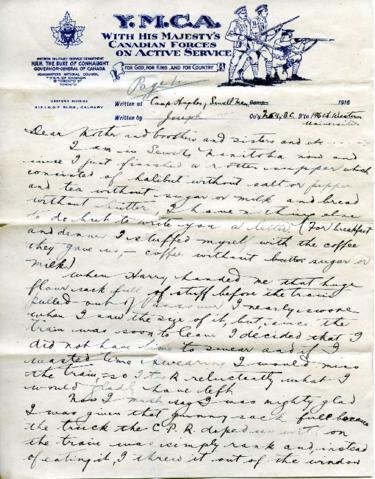 Letter describes Private Seidelman's train journey from Vancouver to Manitoba, and Manitoba's intense weather. Private Seidelman also mentions upon arriving at Camp Hughes, he and his fellow soldiers were received by the Duke of Connaught.